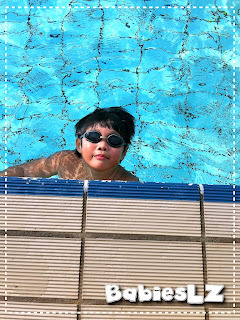 I have been to the pool to see Z's progress for quite some time... Felt very guilty... Most of the time, my friend will fetch & send Z for me. Coz during that time, Beanie needs his afternoon nap. Today, LZdaddy was at home and I was able to leave Beanie with him. Z was extremely excited & happy! Even his coach noticed that! I knew he would be happy but his response was more than I expected... I realise now that my presence at the pool means so much to him.. So sorry my baby, mommy should have been there more often.